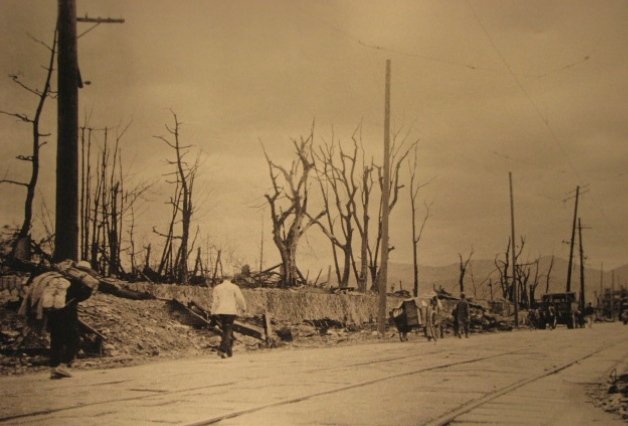 Feature: Hiroshima in early August, 1945. 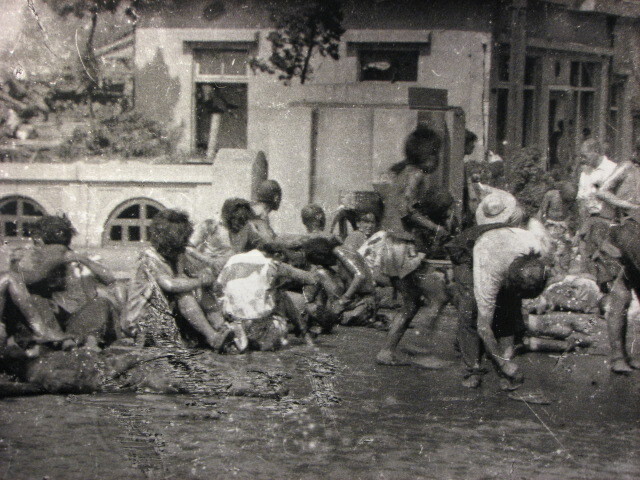 At 11 am on 6 August 1945 this photograph was snapped by a witness who had a camera. 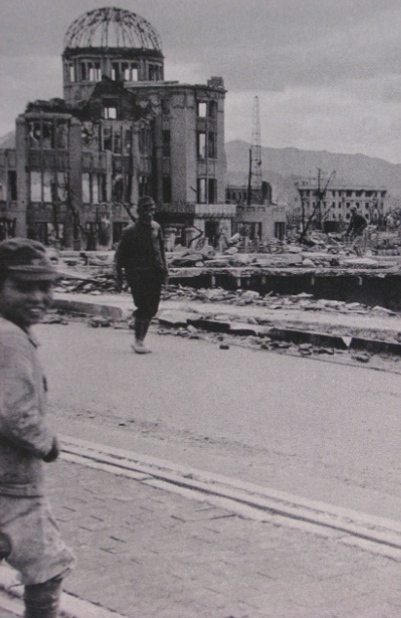 That is just one of a few images we have of the area adjacent to the target that day when an atomic bomb dropped from the B-52 airplane the Enola Gay fell in on an island in the deltaic estuary (river delta) which is the site of Hiroshima's ground zero. The bomb was atrgeted to land on this section of the "T-shaped" bridges seen below but instead hit a nearby hospital. That morning as every morning troops of middle school students, who having been drafted into doing defense work, had been in the streets tearing down homes that might make the fires from anticipated bombings worse. The pre-teen and teen age children were clearing away the debris and removing hazardous structures, or buildings that officials determined to be dangerous based on the fire bombings of other industrial centers on the home island. 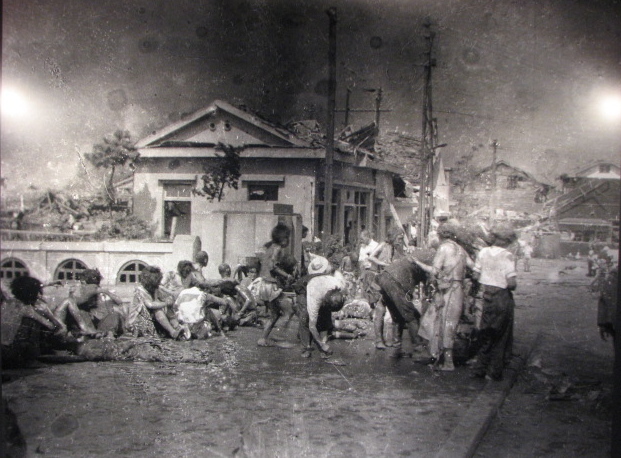 Hiroshima after the atom bomb was dropped at 8:15 A.M. on August 6, 1945. Comparative sizes of the uranium & plutonium bombs. The United States and Imperial Japan had been at war since December 7, 1942 when the Japanese carrier-based aircraft had bombed the Naval and Army facilities of Pearl Harbor in Honolulu, Hawaii, then a territorial possession of the United States in the middle of the Pacific Ocean. Nearly a majority of the island's population were native Polynesians or of Asian Ancestry from Japan and China. The assault was the launch of a three pronged attack on the Philippines and Hong Kong-Malaysia which the Japanese required for supplying the raw materials (oil, tin and rubber) needed to sustain their war in China. Since 1937, the Japanese had been at war with mainland China, seeking to shift the balance in the Chinese civil war between the Nationalists led by Chiang Kai- shek and the Communists led by Mao Zedong. Chiang Kai-shek was a military and political leader of the Kuomintang, the Chinese nationalists who were founded by Sun Yat-sen first President of China when the Manchu or Yuan Dynasty was overthrown in 1910. The Japanese were hoping to restore the Manchu dynastic emperor to the Chinese throne to promote stability there favorable to their prosperity. Japan had signed an alliance with the Axis Powers of Germany and Italy prior to the outbreak of hostilities in Europe (1939). The war in Europe between the United Kingdom and France on one side and the Axis Powers on the of the began in August, 1939 when Germany attacked Poland in an alleged defense of the German population living in Danzig, or the Polish corridor between two parts of Germany called East and West Prussia. Japan was an ally of Nazi Germany and the Fascist Italian state headed by Benito Mussolini. The Second World War is considered by many knowledgeable historians to be the second phase of the Great War (1914-1918) , called World War One, because of the close relation in Europe between the Treaty ending that war and the commencement of the Second. The situation in Asia complicates this idea of a second phase of a two part greater war because Japan had changed sides in the Second World War, having initially been an ally of Britain and France in the First World War. Italy too changed sides in Europe and from 1939 to 1941 the USSR had sided with the Axis Powers of Germany, Italy and Japan. This is the context in which the paths of science and the paths of warfare converged in an untimely and unfortunate manner. The holy grail of science -- understanding atoms and matter-- involved the physical and chemical research into the structure of matter which eventually discovered fission and produced the atomic bombs. The photograph we see on this page is the immediate aftermath of the detonation of an atomic bomb that was the product of forty years of advances in physics and engineering. The bomb was also the product of a race for supremacy in science between Germany and the Anglo, French and American efforts to understand atoms and nuclear physics. 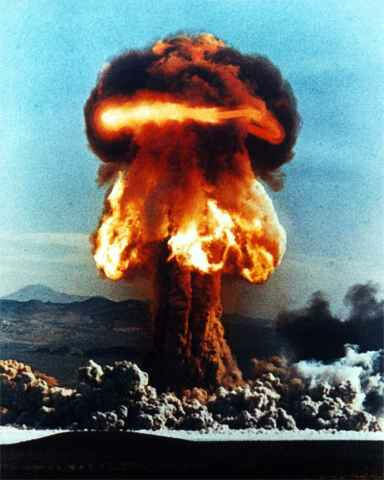 In the final analysis the bomb was the explicit product of a joint military and civilian effort in the US and the UK, called the Manhattan Project to specifically build an atomic explosive device. Work on the Manhattan Project was headed by General Leslie Groves and J. Robert Oppenheimer, a renowned physicist. Instigated by two Hungarian refugees, who were physicists, named Leo Szilard and Edward Teller, the manhattan project took four years, four major industrial laboratories, and two billion dollars to construct three bombs using uranium and its by-product plutonium. The explosive devices were ready in July 1945, however, three months after Germany and Italy had surrendered in Europe. What does the photograph mean?